A particular disorder which is believed by many to be a member of the OC family, has been receiving a lot of media attention lately. This disorder is known as Body Dysmorphic Disorder (BDD), also called by some Dysmorphophobia, a term originated in the last century by Morselli. We call it BDD when an individual appears to be strongly obsessed with what they believe to be a defect in their appearance. They tend to believe that some part or area of their body is misshapen, asymmetrical, wrongly sized, or ugly. Typical BDD complaints can include preoccupations with the face (such as scars, spots, veins, discoloration, acne, or the shape or size of the nose, lips, mouth, eyes, etc. ), the hair (fears of receding hairlines), or the size and shape of any other body part (such as the hips, abdomen, buttocks, legs, hands, etc.). In some cases more than one body part may be involved, or. the preoccupation can shift from one part to another over time. BDD should not be confused with the more common type of dissatisfaction that many people experience with themselves. Ordinarily, many individuals wish they were taller, that their nose was shaped differently, that their breasts were bigger or smaller, or that their thighs weren’t so large. Often others will agree with them, and even suggest that. they do something abut it. In BDD, it is very difficult, if not impossible, to see things the way the sufferer does. BDD sufferers seem to be totally preoccupied with the imagined defect which can be something very specific, or very vague. Often, it may be a defect no one else can see, or it can be something so minor or microscopic that we would judge the person to be grossly exaggerating it. Frequently, the belief in the defect can be so strong it seems to border upon being a delusion. Individuals with BDD tend to spend much time obsessing about their defect, questioning others, checking it directly or with mirrors, or having others check them. Frequent visits to physicians, surgeons and dentists for treatment or correction of the defect are not uncommon. Sufferers will often gather evidence to prove their ugliness. None of these professionals can help, even though they may be sympathetic and do their best. I know personally of several cases where plastic surgery was performed and BDD symptoms returned as soon as the surgery healed. One woman was completely preoccupied with the shape of her nose, had surgery to her specifications, and after six months returned to the same preoccupation when the swelling disappeared. As mentioned before, the degree of belief in the existence of the defect can be extremely high, almost total at times, and frequently higher than we generally see in OCD, although it can vary from person to person. In most of the cases I have seen, there is also a great deal of anxiety over the idea of having the ‘deformity’. Many sufferers seem genuinely tortured. One patient found it so upsetting that it took several sessions and a lot of gradual preparation before we could even mention it in therapy. Individuals with BDD may be depressed because they can not convince others of the problem and not being able to change it no matter what they try. I have sometimes seen other typical CC symptoms along with BDD, many of which frequently include various types of perfectionism and double-checking. Social isolation is also common. The two major modes of treatment which I normally recommend for BDD are the same as those for OCD, medication and behavioral therapy. The fact that medication can help seems to point to a biological basis for BDD. As in OCD, success with medication varies from person to person and the same drugs that seem to help with OCD, Anafranil, Prozac, and others, seem to help completely. For instance, it can reduce the thoughts of deformity, but not always completely eliminate them. Also, a lot of the checking and questioning habits can remain, even when thoughts are reduced. Exposure and response prevention is the primary behavioral intervention. Despite their strong belief in the deformity, there is usually enough doubt that these beliefs can frequently be challenged in therapy. Talk therapy alone will not do the job, though. In behavioral therapy, our aims are twofold. First, we aim to reduce anxiety about thoughts of deformity via repeated exposure to the thoughts. By doing this, we can bring about habituation to the thoughts as the person gradually exposes him or herself to the thoughts. Individuals purposefully experience the anxiety until it dissipates. Eventually the thoughts do not produce anxiety and interest in them decreases. This exposure can be done in a variety of ways, including using audio tapes containing the fearful thoughts, having the person wear clothes that remind them of the deformity, having them go into situations where the thoughts can occur, looking at pictures of ‘perfect’ body parts, reading articles that will bring on the thoughts, etc. Sufferers will frequently ask, <em>”I already think of it a lot and my anxiety isn’t any less; how can this help me?” </em>The answer is that they have not exposed themselves to it on purpose, or for very long, nor have they done it systematically and regularly. Also, when they have experienced the thoughts, they typically don’t stay with the anxiety for long. Usually, they try to avoid it by checking themselves, asking others for reassurance, or escaping the situation; somehow this prevents habituation from ever occurring. Our second aim is to prevent the behaviors just mentioned that sufferers use to reassure themselves and terminate the anxiety. Homework for the response prevention part of the treatment can typically include such things as not inspecting body parts by eye or in mirrors, refraining from questioning others or seeking reassurance, wearing previously avoided clothes that remind the person of the deformity or accentuate what they imagine it is, not consulting physicians or surgeons, not running away from or avoiding situations where they imagine they are being scrutinized by others, etc. A good example of a treatment situation was the case of a man who believed he had numerous spots, or marks, on his face. Others could not see them. He did convince a reluctant dermatologist to try different therapies on him, including several laser treatments. This treatment never produced satisfactory results — the spots never seemed to go away. He finally sought therapy. His behavioral treatment involved listening to tapes telling him how ugly the marks made him, how because they would never go away, and that he would be deformed for life. Additionally, he was instructed to cease visiting the dermatologist, to stop spending hours stating at his face in the mirror and to not question friends or relatives about his appearance. He felt quite anxious and nervous at the start of treatment, but the above instructions, combined with antidepressant therapy, resulted in recovery over a three-month period. Generally, by combining this type of treatment with an OCD drug approach suited to the individual, symptoms and anxiety can be greatly reduced, if not eliminated. Please note here that I am speaking from my own clinical experience; much more research needs to be carried out in the use of these treatments for BDD to judge their effectiveness. I can say, though, that these are the only two approaches I have ever seen work for this disorder. 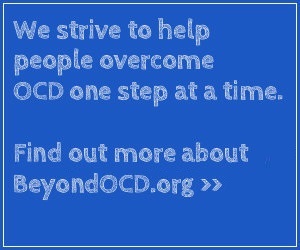 When other OCD symptoms are present as well, they will also benefit from medication and behavioral therapy, sometimes responding even more so than the BDD symptoms. Can everyone with BDD benefit from such treatment? Honestly, the answer is no. Some individuals with BDD have such an unshakable belief in their deformity that they either refuse to engage in the treatment at all, or else will do it, but only halfheartedly, as they believe that everyone else is wrong and they are right. What percentage of those with BDD falls into this category is not known. I would advise those with the disorder to give treatment a chance; sometimes those whose beliefs seem very strong can still be successful by first starting with medication which can weaken and reduce the thoughts, and then make them more receptive to the idea of therapy. Family counseling for those close to BDD sufferers can also be of great help. This is a very puzzling problem for those who are a part of a sufferer’s everyday life and who are uninformed as to what is happening. With help, family members can learn to be supportive of efforts to seek treatment, and to not pressure, punish, or ridicule as a way of dealing with the sufferer. The number of therapists who can treat BDD probably remains small at this time, but there are those familiar with OCD who should be able to adapt their methods. Just be sure they are qualified and if you don’t immediately find one, keep looking. Persistence is the key to beating OCD and OC-related problems.